On Sept. 26, 2014, Keith Twiggs ran headlong into Operation Meatball and he didn’t even know it. 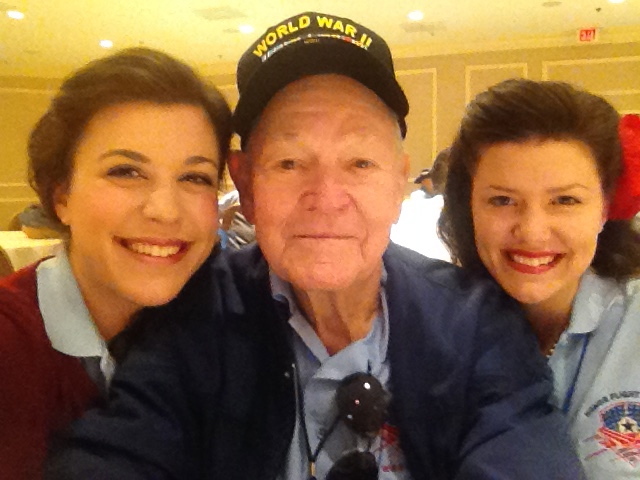 He arrived in Washington, D.C. with dozens of World War II vets on an Honor Flight from Austin. None of them had any idea Operation Meatball was lying in wait. As the veterans exited the plane, they were each seated in wheelchairs and pushed across the tarmac by guardians. A young girl was handing out yellow roses to each man as he passed and when Twiggs reached her position, the procession paused. Virginia Phillips stepped closer and had her picture taken with Twiggs. Then the veterans were on the move again. Twiggs and the other 48 men in the group embarked on their day of travels around the nation’s capital. 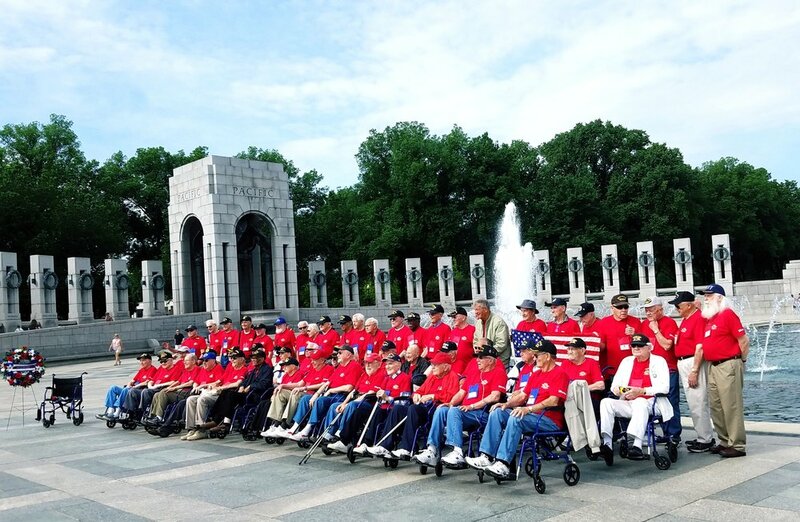 The following day, the vets visited the World War II memorial. A young woman with dark hair and wardrobe from the 1940s began the program by singing one of Twiggs’ favorite songs, “Begin The Beguine.” The tune was written by Cole Porter and made famous by Victor Shaw in 1938. When the song was finished, Twiggs began to learn of three sisters — Jubilee, Liberty and Faith — and their three-year journey to honor the men and women who of World War II. The trio were from San Antonio and had found out that a group of veterans from Texas would be visiting D.C. that weekend. It was the perfect time to kick off a quest they called Operation Meatball. When the program at the WWII monument finished, the performers mingled with the veterans. Faith Phillips walked straight up to Twiggs. “He said, ‘Hey, you sang ‘Begin The Beguine.’ I love that song,” Faith said. They formed a connection instantly. The song was also a favorite of Faith’s grandfather. Though she was only 14, she loved “old” music. She had followed that song with a Glenn Miller standard, “In The Mood,” and Twiggs had another message for her. “My wife and I, our first dance was to ‘In the Mood’ when went to school together up in Oklahoma,’” Twiggs said. The musical bond between Faith and Twiggs deepened a moment later when they both realized something: they didn’t like Frank Sinatra. To clarify, they didn’t like Frank Sinatra after 1950. Before that, he was great. Call it fate, call it luck, call it coincidence, but whatever you call it, the stars aligned that weekend in 2014 for a small group of Texans. The Phillips sisters received their love of history, and specifically the World War II era, from their parents, Doug and Beall. In 2011 and 2014, the family visited Normandy for the anniversary of D-Day and the trips proved to be life-changing experiences for the sisters. “We came home and said we have to find a way to meet more veterans and spend more time doing this,” Faith said. Faith was 14 years old, Jubilee was 16 and Liberty was 18. “So we said we’ll dedicate the next three years (to meeting veterans) and technically the three years is up, so we’re recalibrating how forward into the next phase,” Liberty laughed. The girls speak from the Twiggs’ living room in Kruse Village. Jubilee was not able to make the trip, but five other members of the Phillips clan have stopped for a visit on the way home from a wedding in Georgia. Faith and Liberty are there, as well as their mother, Beall, and younger sister Virginia with younger brother Providence. It is the third reunion since their introduction in Washington, D.C.
On this visit, Twiggs broke out his trombone, an instrument he says might be older than him. He turns 94 on Nov. 18, but his father bought the horn in the late 1930s from a pawn shop and there is no way to know its age. It was dented and without a case, but Twiggs played it throughout high school. He acquired a case at some point in the horn’s history, but even that article is older than all the guests admiring the relic in the living room. The Phillips family loved it immediately. At the end of the day, as they packed up to head home to San Antonio, Twiggs gave them the trombone as a gift. The horn came into his possession roughly 80 years ago in Seminole, Oklahoma and now it will live on in San Antonio. Twiggs grew up in Seminole surrounded by oil fields, but he was never big enough to work the rigs. When he was 11 years old, he met his wife Elizabeth in the tiny town of Slick, about 40 miles south of Tulsa. She was nine at the time and Twiggs’ family was visiting her family for a Sunday luncheon. 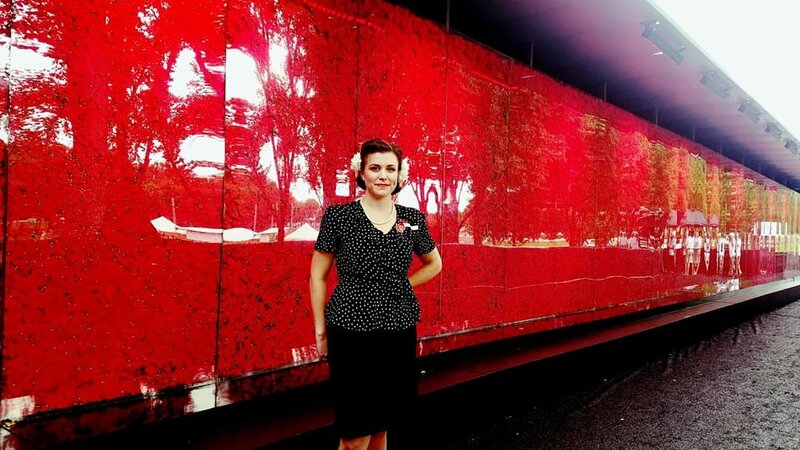 A year later, Elizabeth moved to Seminole when her father’s job with Gulf Oil transferred him to the area. She and Twiggs lived no more than 100 yards apart and were close throughout high school. At 17, Twiggs moved to California. Those two years and the three he spent in the service were the only five years he and Elizabeth have been separated. They married in 1947 and April 15, 2018 will mark 71 years of union. Twiggs was a natural mechanic and when he entered the military his abilities quickly stood out. He had spent some time helping build Highway 59 outside Houston and had worked in the shipyards in California before he received his draft letter. He reported to the dry dock in San Pedro and was sent to Biloxi, Mississippi to receive training on B-24 bomber engines. He bounced from Texas to Michigan to Utah and eventually received his discharge while he was in California. He quickly married Elizabeth and 65 years later, their lives would intertwine with a family from San Antonio that had a love of WWII history. After their fateful trip to Normandy in 2014, the Phillips sisters decided to host and attend events that honored WWII veterans. The girls dressed in the style of the 1940s and Faith began to build a repertoire of songs from the era. No one remembers how the plan came to be called Operation Meatball, but the name stuck. They started a website and a blog to chronicle their experiences. They took photographs aplenty and Faith recorded some classic songs of the day. And it all started in Washington D.C. on a weekend in September. Jubilee, Liberty, Faith and Virginia were part of the greeting committee as multiple Honor Flights arrived at the same time. Faith sang during the greeting and the next day, a woman remembered her and quickly asked her if she’d be willing to perform again. The woman happened to be with Twiggs’ group of veterans from the Austin flight. Faith sang two songs that resonated with Twiggs and then ended up speaking to him when the program finished. Twiggs and his wife Elizabeth began to correspond with the Phillips family. They exchanged letters, phone calls and emails and Faith sent photos and CDs of music. The girls traveled to Kruse Village for visits and actually performed for residents on one of the trips.